I have been intending on making Kit Kats for a long time. I bought the wafers months ago, and just never got around to doing it. Yesterday I finally decided to do a bit of research as to what the filling in Kit Kats actually is. Lo and behold, the filling is more Kit Kats. Apparently Kit Kats that don't make it, as in they are not perfect, get ground up and used in the filling. 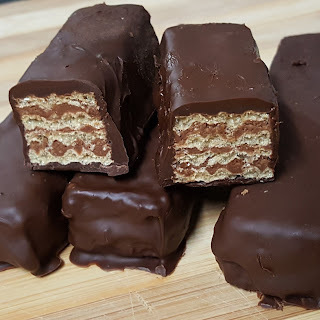 So I started with the clue, that the filling has to have wafers in it. I used these wafers (Altimate Natural Ice Cream Wafers). Please note that these are the natural and not the extra thick. The extra thick will not be as nice when you assemble the Kit Kat finger as they are too hard. 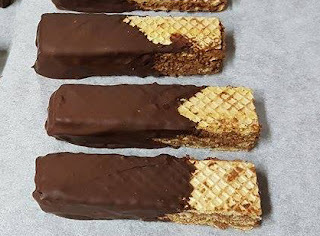 This recipe makes 8 Vegan Kit Kat fingers. Place your chocolate in a double boiler to melt. Keep it melted until you're ready to dip the wafers. To make the filling, put the wafers in the bowl of a small food processor, or the processor that comes with a stick blender. Process until they turn to a powder. Add sugar, nuttelex and chocolate and process until all combined and a uniform paste is formed. Each wafer has a large pattern on one side and a small pattern on the other. 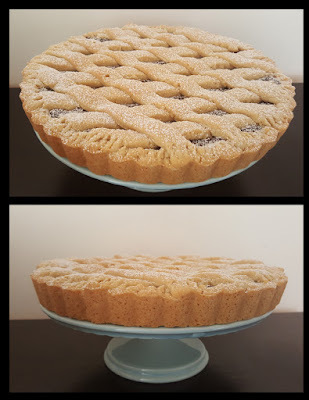 Spread the filling on the large pattern. Do two at a time and then stick them together. Gently press them so that any excess filling comes out of the side. Gently scrap off the excess with a butter knife. Once the 16 wafers are done, you will have 8 sandwiched wafers. Spread filling on the top of 4 of the sandwiched wafers, and cover with the remaining ones. You will be left with 4 sandwiched wafers, each having 4 layers. Cut each of these in half lengthwise. Dip half the fingers in chocolate, and place on a tray to set. You can put them in the freezer to speed up the process. Once that side is set, you can grab the finger and dip the other end. They were devoured at work!! !